For those of us following a grain free (Paleo) diet, missing the morning muffins has been a consistent complaint we’ve run across. Many of you have participated in the Paleo Challenge, Whole 30 day challenge, or are following the Primal Blueprint diet. In any case, I constantly run across comments or posts related to the missing of easy breakfast items, especially those with a slight sweet appeal. So in a quest for a tasty and healthy muffin option, we ran across this post from Elana’s Pantry which not only solved our grain free needs, but as she suggests using coconut oil as well, it’s a great heart and brain healthy option too! In case you have some questions on the value of coconut oil you can head over to our post here and read more about some of the many benefits to coconut oil, not the least of which are aiding and restoring gut integrity. No need for modifications here so we are posting this recipe just as we found it – enjoy! 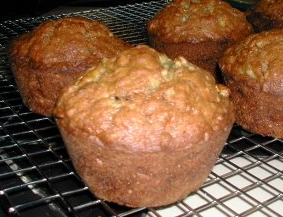 4 Pings/Trackbacks for "Paleo Banana Walnut Muffins"
to the main subject of the blog.